Lakeshore Foundation is a non-profit 501c3 organization that promotes independence for persons with physically disabling conditions and opportunities to pursue active, healthy lifestyles. Lakeshore Foundation is currently seeking an energetic, creative, resourceful, self starter with exposure or experience in conducting research related to exercise science. This is time to begin the process of selecting a host for European Congress of Adapted Physical Activity EUCAPA 2016. The board directors of the EUFAPA will start selection process for EUCAPA 2016 during its next meeting beginning of 2014. At this time, we seek the draft proposals from prospective bidders. Please find attached the announcement notification of the funded research bursaries offered by the Institute of Technology Tralee. The research contributes to the work of our UNESCO Chair programme and we encourage you to circulate to interested prospective students. Applications are available online as per the attached advertisement and the deadline for application is 3rd September 2013. The bursary covers academic fees and offers 500 euro per month towards living expenses for a two year period. 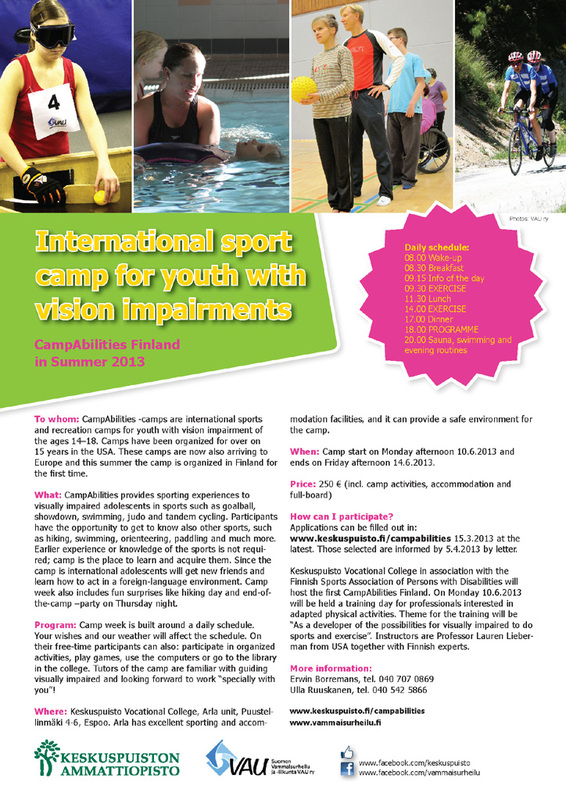 To whom: CampAbilities - camps are international sports and recreation camps for youth with vision impairment of the ages 14-18. Camps have been organized for over on 15 years in the USA. These camps are now also arriving to Europe and this summer the camp is organized in Finland for the first time. Another great Inclusion Club Episode has just been published. It's under the category of Models of Good Practice and looks at an inclusive basketball related game called Bankshot. It was invented more than 30 years ago by Rabbi Reeve Brenner from Maryland in the US. It's a fascinating story and a great example of inclusion working at a local level.